There is an optimism that comes with Springtime. It seems that whatever was dragging you back, pulling you down, slowing you up or otherwise draining the energy from you in the winter is replaced with a new way of looking at things when bright green leaves return to the trees. Even if the things you are looking at haven’t changed much, they just look better in Spring. Words like “fresh”, “green”, “can”, “go” and “start” are easy to use to describe a Springish outlook. And it’s free for the taking, that outlook. It’s free to just pick off of the trees with our eyes, and to inhale from the air, and to absorb from the blue sky. Looking around at the world in Spring is like looking at water in a river flowing by. If you can just look at it you are an observer and that’s mighty fine, but if you can leap into the water and feel it against your skin you are a participant in the jumpstarted activities of Spring. Planting a garden is like jumping in the water, I think. Like everything else at this time, you can either get into the flow of stuff going on, or not, but right now it’s easier to do than at any other time of year. Why? Because it’s so hot in Summer that things resist doing, and in the Fall we feel better but in a wrapping-up mode not an initializing one, and Winter fits the new phrase of choice for what we used to call hiding – “hunker down”. But Spring, now, Spring feels like a redemption for winter. It can be the reason we feel that going on is very worthwhile, instead of allowing the malaise of winter to have more than its due. We plan in Spring, we plant in Spring, we start new things in Spring. 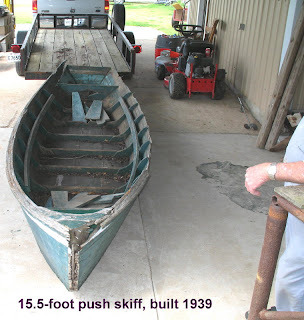 We find old boats to repair, or build new ones to start a new year on the water. What is spring cleaning, except giving ourselves a fresh start? So, for all these reasons and hundreds more, the bright green of Spring enlivens us. The birds make it hard to not notice a change in the dynamics of the world in Spring. All those that have been here all year suddenly start singing in prominent places, and loudly. Those that belong up north but have vacationed here for the winter are ready to go back and sing for the people there, and those that have survived the dangers of the thousand-mile trip to the south are now returning in unbelievable numbers, singing all the time. With only a little knowledge about birdsong, it is easy to identify the different species around us. 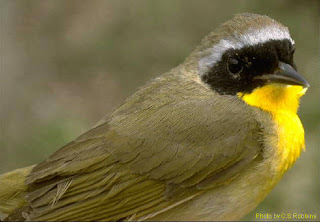 Last week I went outside in the early daylight and heard a common yellowthroat singing “witchity witchity witchity” ( picture courtesy of USGS). I had not heard that song since some time last year, but here it was, loud, like the knock on a wooden door announcing a welcome visitor you haven’t seen for a while. That day I drove down the levee to Myette Pt, about 40 miles away. I stopped four times on that trip and every time I stopped and got out of the truck, there was the common yellowthroat along the edge of the swamp letting the world know that it was alive and with us f or another Spring. How can that not be an event of significance? It surely is, I think. And not just the yellowthroat. The ruby-throated hummingbirds came back last week, looking for the nectar feeders that they always find here. Not many yet, and seemingly all males, but all dressed in the freshest feathers for the females that will come soon. Swamp canaries (aka prothonotary warblers) came from South America day before yesterday, singing “sweet sweet sweet”, an unmistakable voice if we listen in places near to water. Added to that this morning there are Northern parulas (a warbler of the treetops, “zzzzzZZZZZIT”), yellow-throated vireos (“here I am, where are you?”), both either staying here for the Spring family exercises or going on to more northern territories to do the same. It’s like there is so much to do in Spring that every minute of the day and night is spent by something singing, and each of those somethings is interesting in itself. Frogs use the night to voice a Spring welcome. Some species have already finished egg-laying in the ditches and larger puddles, but the ones that like warmer temps to practice that ritual are now calling from the borrow pit in front of our house. 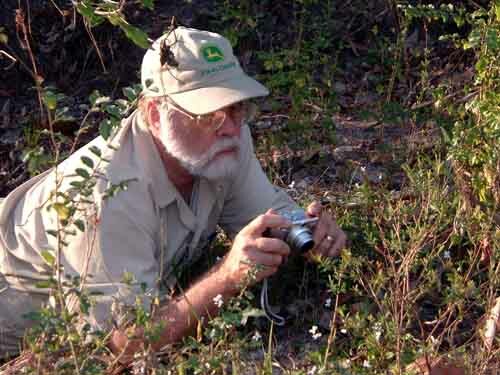 Gray treefrogs, Gulf coast toads, cricket frogs, and soon others, are simple to identify with a minimum of practice and study. As the phase of Spring reminds me that joy in life is a factor to be appreciated, an event signifying another phase of the cycle often comes unwanted and suddenly. Great loss is always close by, as if to remind us that it is the whole cycle that we must pay attention to, not just one piece of it, or not just what we find pleasant and happy. Last week a friend, a fellow fisherman, was lost from his boat and has not been found. Regrettably, I believe this accident is probably a reminder of the potential for great loss. It is important to acknowledge that even this is a part of the cycle we all belong to. It is accepted, though not sought. The river is at 9.2 feet on the Butte La Rose gauge today, rising to 9.7 feet by next Wednesday, and it will go a good bit higher after that. The Ohio and Mississippi are both rising strongly all the way up their watersheds. Looking like a longer crawfish season than might have been. Bright sun right after sunrise a couple days ago, and then the rains came. The gray treefrogs are convinced spring is here and it’s time to set the next generation on its path. 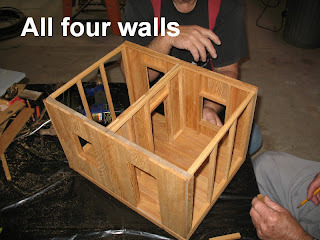 My friend Edward Couvillier has been wanting to teach me some of his woodworking tricks for a while now. 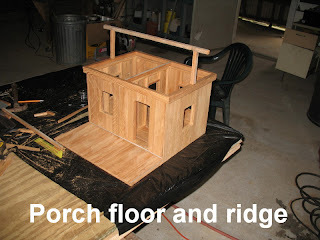 He decided that the project that would do this would be to build one of his beautiful, scale model, cypress Cajun houses. We began that yesterday and continued today and the pictures here show how far we got in two half-days of work. 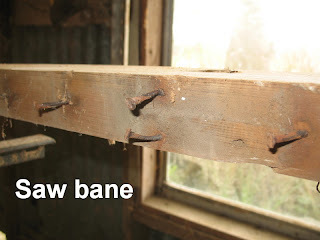 The wood is ripped from reclaimed 2x4s, with a serious attempt to avoid the old nails. 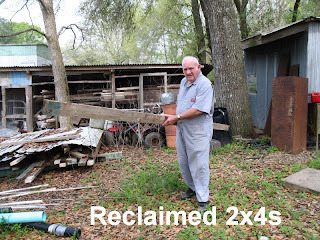 These particular 2x4s were part of the floor of a houseboat belonging to Myon Bailey. It was built in the very early 1900s, and was salvaged for lumber last year. What a wonderful thing if that wood could tell the tales of what went on on the floor of that houseboat. From coffee at the kitchen table to decisions about how to respond to rising water, to wondering if the priest would come this week to give first communion to some child who had reached the right age. What stories! 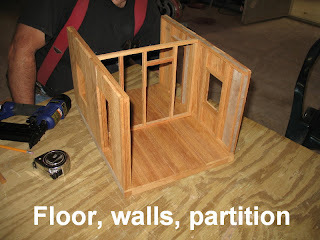 Edward builds these little model houses on a scale of one inch equals one foot. They pretty accurately depict the small houses that Basin dwellers lived in if they lived on land. At least they depict the houses Edward and his family lived in before moving onto houseboats. He told me today that their houses were not as nice as this. The wood they actually used was “pews” split out of old cypress stumps, not sawn lumber. Even though the cypress would split wonderfully well, and you could even the edges of the boards somewhat with a drawknife, when put side by side they still let a lot of the outdoors in. Edward’s mother would mix flour with water to make a glue, and use that to paper the inside walls with newspaper. This would somewhat seal them from mosquitoes and cold weather. I am always impressed with what it takes to make one of the little model boats Edward makes. They are so well done that if you could wave a magic wand and say “grow” they would be ready to fish with. 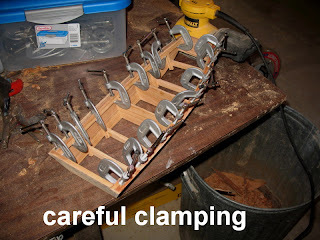 The clamps here are used to bend and hold the “stripping” along the top of the gunnel. Since Edward has been invited to display his recently built boat at the New Orleans Jazz and Heritage Festival this year, he is doing some of the models to sell if people show an interest. he osprey rests from time to time. 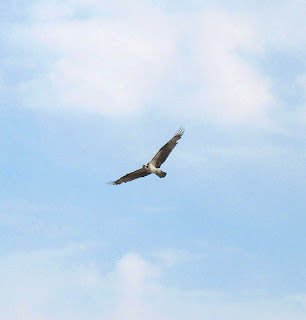 When the osprey saw it, it began harassing the hawk with loud cheeping calls and diving at it with the same posture it uses to catch fish – legs extended straight down with claws wide open. The hawk put up with that for a couple minutes and then just took off back into the forest. The osprey landed and preened and then also left the area. Based on other observations, it looks like the pecking order (in a real sense) is eagles peck ospreys, and ospreys peck red-tailed hawks. I guess red-tailed hawks peck something else. The river is at 11.3 feet on the Butte La Rose gauge, holding steady there for the next several days. The Mississippi and Ohio are not going to sustain this rise. They are both falling, especially the Ohio. If nothing happens to put more water into those watersheds, we will have a severe drop in the Basin in about ten days. Get them crawfish while you can guys! Sunrise a few weeks ago. I’m sitting here, on the dock, watching the debris float by and trying to figure out how to tell the s tory of the bateau we built last spring. I think I could tell the story, but I have to try to do it in only 20 minutes tomorrow at the Louisiana Folklife Society meeting. That’s a problem. If only pictures tell the story and I show 80 slides, even that won’t do it justice. If I talk for the whole 20 minutes and show only a few pictures, people will feel that they should have seen more pictures. Right now I have 41 pictures to show, and explain, taking about 30 seconds each. It would probably be better to cut that in half, but I can’t do it. After tomorrow I will know a better way to do it, but that’s after tomorrow. It all comes back to the adage “Never do anything for the first time”, because you always know how to do it a lot better the second time. Whenever someone hears that they always say “What???? How?? ?”, but it’s always true anyway. The story is about a boat, a 16-foot bateau (jo-boat, john boat) built mostly out of 1000-year-old cypress (that’s a guess, but an educated one). How best to tell that story? You might tell it from the point of view of the people who built it, and the culture of those swamp-dwelling houseboat people. You might focus instead on the function it had in the old days – that of catching and transporting catfish caught on trotlines – and tell how it did that. Or, maybe the bayous and lakes that saw it come and go, you could use them to tell the story. I have an idea though. Have the boat speak for itself, as if it had a memory of its beginning, and its life, and its ending. Because in reality it is almost a living thing, needing care, having a function or more than one, and doing what it was created to do. That story is for a future posting. The air is full of winged ants right now. The purple martins must be having an easy time of it with all this food offering itself up free of charge. Some of the ants are getting between the keys on this keyboard and falling down out of sight in the mechanism of the computer. I wonder if that will cause a problem. This is not something most technicians will be familiar with, I think. A basketball is floating by. It floats high, so it must still be full of air. It might have come from a yard in Missouri a few days ago. How far might it get before it sinks out of sight? Someone on Sanibel Island may find it on the beach, if it lasts that long. And now floats by a 50 foot tree, complete with roots but mostly smooth of branches. The tree trunk is very light gray and dotted with messages left by many birds. As it passes, a crow lands on it. He strides the trunk from one end to the other looking down at things, hitchhiking for a hundred yards or so. He hops up to the tallest root sticking up in the air, pauses, and takes off downriver. By his voice as he leaves he is a fish crow, not an American crow. He is nasal, not raucous. Here is more wood passing, this time a large chunk of tree . Some of this stuff, like this piece, has been in the water so long that it is completely rounded on every corner, end, or angle, or previously sharp ridge. There are deep gouges in it from being hit by many propellers over the years. These are deep cuts, made by big boats – those boats that don’t care if they run over something as insignificant as a ten-foot log two feet thick. Those are very proud boats, those big tugs on the river. Now what is that? It seems to be half of a plastic 55-gallon drum, floating high. It is white and makes announcement from a long way away. It is caught in an eddy in the middle of the river right now, and momentarily slowly spins in place, resuming its trip downriver after a few seconds. The drum could have started this trip in Saudi Arabia, as petroleum exported to the U.S., later converted to plastic. And here it ends as half of a plastic drum, fated to eventually sink and remain as part of the bottom environment somewhere. If it sinks here in this river, or in fresh water somewhere else it will no doubt be a good place for catfish to spawn. Some of my friends would not see that aspect of a drum on the river. They would see only a piece of ugly plastic floating along. 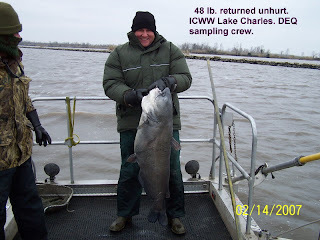 But the big blue catfish in the picture (shown here courtesy of Kirk Manual) would welcome the big cavity to nest in. Late last year I posted something that reflected how I was feeling about a good friend about to undergo a dangerous operation and, almost simultaneously, the news that a new grandchild was in early gestation in Texas. A possible ending and a possible beginning, a new life and one that was possibly in transition. 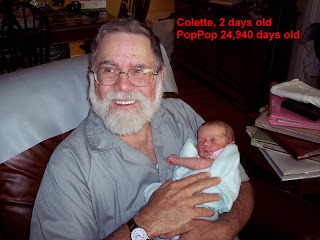 The picture here is Colette, the new life, born in Houston last week. My friend in the hospital said goodbye to us. The river, as I watch it go by a few feet away, is at 10.0 feet on the Butte La Rose gauge, rising a little to 11.0 feet by next Tuesday. The Ohio and Mississippi are slowed from rising fast right now, but are coming up again in their upper reaches. The Corps of Engineers has put out a press release stating that the river could rise as much as 24 feet (19 to 24 they say) this spring. They have warned interests in the Morganza Floodway that it may be necessary to remove cattle and other things from the floodway this year. It is hard to know whether they really have data to strongly suggest a major high water, or whether the New Orleans experience has made them more cautious (conservative) than they used to be. Either way, is always better to be safe, both for the Corps and the people a flood would affect. But if people go to a lot of trouble and prepare for high water and it doesn’t come, woe to the Corps. Truly, they can’t win. His Excellency Napoleon Bonaparte on the dock rail at sunrise this morning. This is just to record that the water has begun to rise. All that rain and snow in the Ohio Valley has done what it used to do regularly, and does not so regularly any more. It has come down here to pay us a visit in early March. It’s not clear how much of a rise this will be, but all the rivers are coming up all the way to Pennsylvania and Minnesota. This is not a flood, but it is enough to encourage the crawfishermen to buy some more wire and make some more traps. The river is at 7.1 feet on the Butte La Rose gauge right now, rising to 9.4 feet by Thursday. As above, the Ohio and Mississippi are both rising strongly. Here she comes, and on time. (I am tempted to add “for a change”, but why take a chance on irritating Mother Nature).